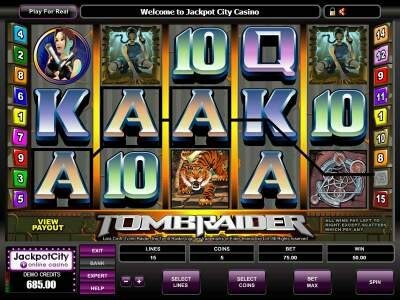 Tomb Raider is one of the most popular Microgaming games and most played games on the internet. The game can be found at Microgaming casino including Gaming Club and Jackpot City alongside other online casinos. The game, clear from its title, is themed around one of the most popular gaming and movie characters of all time, Tomb Raider, Lara Croft. This is why players will see that numerous symbols are inspired by the game and the movie. These symbols include a tiger, poker card symbols and Lara Croft “Tomb Raider” in many positions holdings guns. The symbols are in 3D, which adds to the amazing experience of the game. The Tomb Raider Logo is the wild symbols of the game, it can substitute any other symbols except the scatter or the bonus symbol. The bonus symbol is the golden statue and it can trigger the bonus round when a minimum of 3 bonus symbols appear on the reels of the game. As for the scatter symbol, it is Lara croft holding 2 guns and it can trigger the free spins round.